The world of photography has a measurement to tell you how “zoomed in” or “zoomed out” you are. It is called “focal lengths” and today I’m going to explain the scale and show you how it works. it will help you understand which lenses you need (every lens is identified by the focal length). 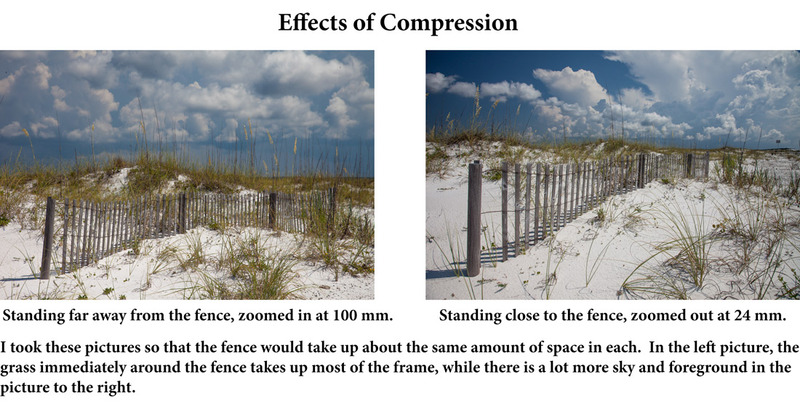 it will help you with your composition as you understand the effects of taking pictures at different focal lengths. I will start by telling you what focal length is, then give you some examples, and finally show you how it might apply in your photography. What that means to you and me is that if the lens is close to your sensor, the angle of view is wide and there will be a lot of stuff in your frame. Conversely, if the lens is far away from the sensor, the angle of view will be narrow and you will have zoomed in on a subject. So that is the official explanation, and now I’m going to show you pictures taken at different focal lengths, which I think will be the key to you understanding this. Check out these pictures, which were all taken from the exact same spot, with the lenses zoomed in or zoomed out to varying degrees. I put the focal length of the lens at the top. As you can see, the smaller the number the more wide the angle of view. Hopefully that makes sense to you now. Now that you have an understanding of the scale, I want to tell you how this applies in everyday photography. 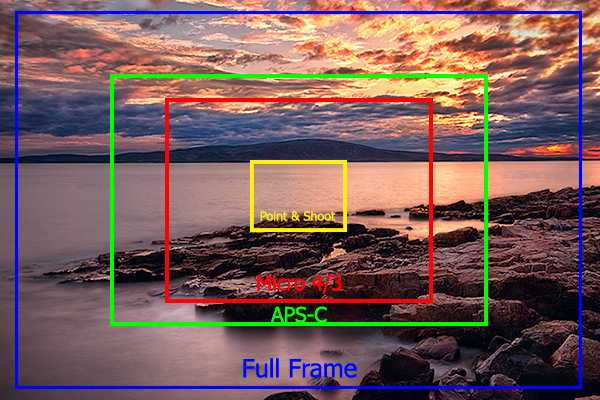 If you buy a “prime” lens, it is set at a given focal length. If you buy a “zoom” lens, it will cover a range of focal lengths. No lens covers all focal lengths or even most of them. Most lenses cover only a very limited range of focal lengths. So the first time you will need to think about focal lengths is when you are buying a lens. So consider what type of photography you will be doing before you buy a lens. Then you will want to use the lens to the best effect. Some parts of this are obvious. You cannot just walk right up to an animal in the wild, so if you are doing wildlife photography you will need a high focal length. And if you are doing landscape photography and want the whole scene in your frame you will want to use a low focal length. But there is something else for you to consider. Zooming in on something is not the same thing as actually getting closer to something. This is due to something called “compression” which makes things in your frame look closer together at higher focal lengths. The next time you are taking pictures, try taking two pictures of the same thing. For the first picture, get very close to the subject and zoom out. For the second picture, walk away from the subject and zoom in. The point is to make sure the picture covers basically the same field of view. Compare the pictures after having done so and you will see two very different pictures. That is the result of compression. So we have a nice tidy system for measuring focal lengths, but now I’m about to make it more complicated. It is due to the crop factors caused by different sized sensors. As you may recall if you are familiar with our post on image sensors, the same focal length will look different if you have an image sensor that is of a different size. 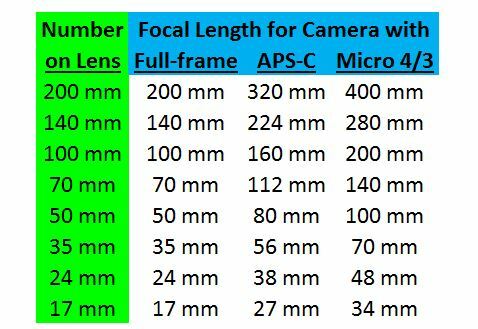 The focal length measurements we have talked about are for a 35mm camera. As a result they will look exactly the same on a “full-frame” digital camera. That makes sense since a full-frame sensor is exactly the same size as a 35 mm piece of film. So if you are using a digital camera with a full-frame sensor, everything we have discussed so far remains unchanged. But if you are using a smaller image sensor, the sensor can only fit a smaller portion of the image on it, so it will appear more “zoomed in.” On a camera with an APS-C sensor, something shot at 50mm will appear closer or larger, more like you shot it at something like 80mm. In fact, the crop factor for a camera with an APS-C will be either 1.5 or 1.6 depending on the brand. You apply that factor to the focal length of your lenses. So if you bought a 50 mm lens and put it on your APS-C camera, it will shoot like an 80mm lens on a full-frame camera. There is nothing inherently bad about a camera with a crop factor. Just apply the conversion factor and you should be all set. 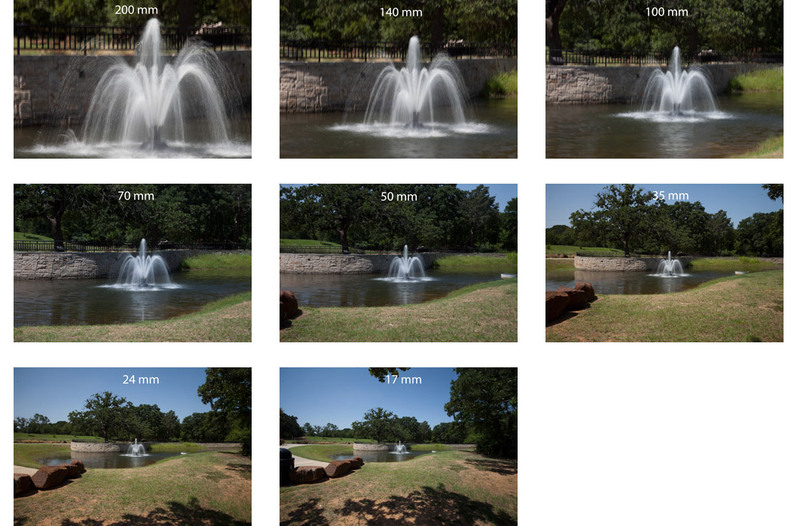 Now that you understand the focal lengths, perhaps our lens recommendations will make more sense. If you already have a lens, the hopefully this will help with your composition. What is the Zoom on my Flash? Should I Set it to Match the Focal Length of My Lens? The First Thing to Look at When Buying a Digital Camera Understanding Aperture & Depth of Field Should I Start with a Prime Lens or a Zoom? Should You Turn Off Image Stabilization When Using a Tripod?